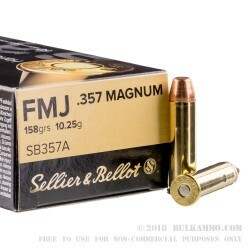 This .357 Magnum ammunition from Sellier & Bellot is a clean-shooting, accurate target load that will serve well in your revolver. 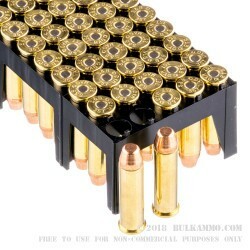 Each cartridge in this case of 1,000 comes packaged in a box of 50 (with 20 boxes in each case) and fires a 158 grain full metal jacket bullet at a muzzle velocity of 1,263 feet per second. 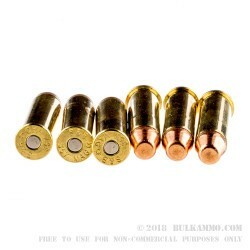 The FMJ bullet provides reduced fouling and airborne lead exposure risk, making it a particularly good choice for indoor shooting. 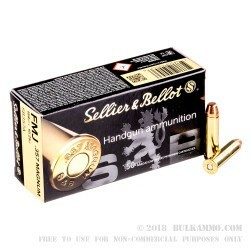 Sellier & Bellot ammo is loaded in the Czech Republic using non-corrosive Boxer primers and reloadable brass cases. S&B is one of the world's oldest ammunition companies, having been in operation since the 1820s.